Daughter of Les & Joan Allan and sister to Chris, Katie originated from Belfast and settled in Fradley, Staffordshire with husband, Stuart, and two children, Sam and Sophie. Here’s the press release covering Birmingham Airport’s ‘Harlem Shake’ for Katie on Wednesday 3rd April 2013. Birmingham Airport gets all shook up for brave Katie. THE Birmingham Airport ‘family’ has come together to support one of its own. Workers from the airport and its airlines came together to take part in a global dance craze to show their backing for battling young mum Katie Scarbrough who is suffering from advanced bowel cancer. Katie, aged 32, works at Birmingham Airport for SN Brussels and has previously worked for the ground handling agent Aviance and British Airways. Although seriously ill, Katie, who lives in Lichfield, is raising money for cancer charities and writing an inspirational blog. 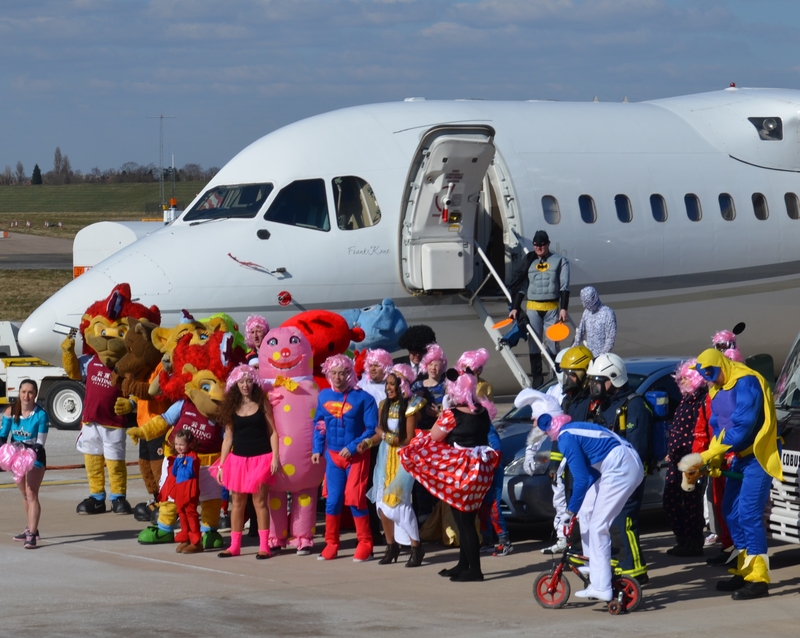 She wanted to put a ‘Harlem Shake’ on her YouTube site and staff throughout the airport rallied to the cause. 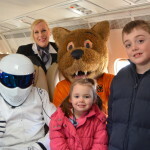 An appointment for chemotherapy treatment prevented Katie from being at the Eurojet terminal to watch the dance in front of Cello Aviation’s VIP jet but her children Sam, aged eight and Sophie, who is four, took part watched by Dad Stuart. 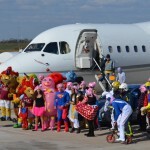 The airport provide a bus for the dancers, firemen joined in and security staff helped make it an afternoon to remember. 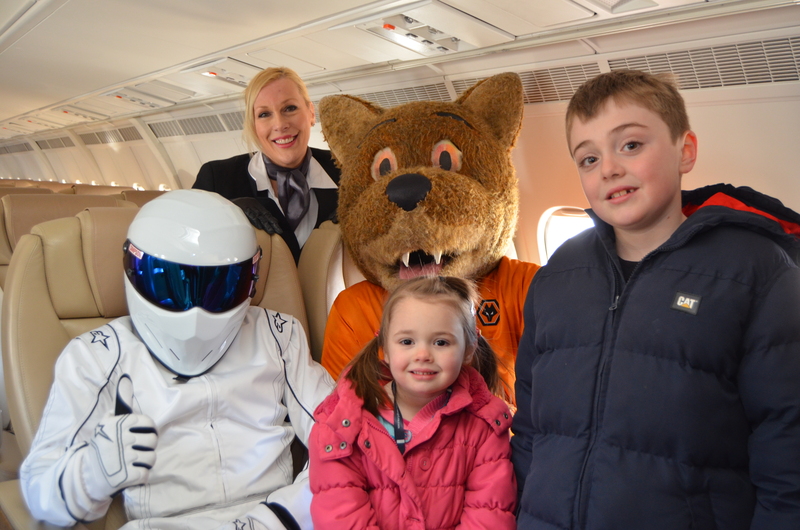 Caption: The Stig, the Wolves Mascot and Kris Thelfall-Leasure from Cello Aviation with Sophie and Sam Scarborough. Originally from Glasgow, I live in Fleetwood with my partner Andrew and work as a professional Singer and freelance web & media Creative. 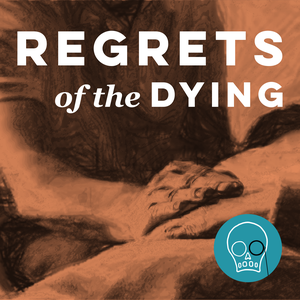 Hear Katie’s blog come to life in this recent Podcast by Georgina Scull as featured in the Huffington Post. 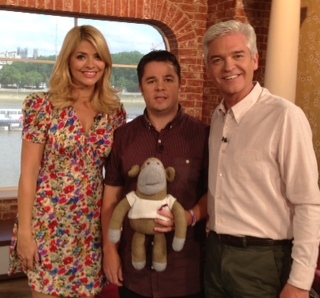 Katie's husband Stuart fulfils one of her last wishes to appear on the sofa at ITV's This Morning with Phil and Holly. Being an ex competitive Ice Skater and British Junior Champion, Katie's Belfast friends produced a spectacular Ice Gala in March 2013 helping to raise over £15,000 for Katie's chosen charities Bowel Cancer UK and Cancer Research UK. 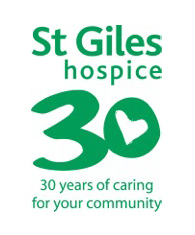 Fundraising events continue in Katie's memory, click here to find out more. All images and content contained within this site remain copyright of their respective owners. Use or reproduction is strictly prohibited without prior, written consent.